Create adorable hand-made gift boxes for all of your crafty creations with this set of die-cuts. Choose your favorite cardstock and make someone you care a pretty present from the heart. - Largest die approx. 5" x 7"
I have been having so much fun making these. I'm going to have to start giving them away. I have some ideas I want to try with them. Love this dies set! Made Easter boxes for my grandkids. Dies are very easy to use and the boxes came together pretty quickly. I used my Gemini Jr and Go to cut the dies. 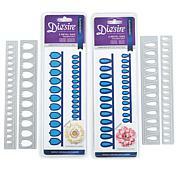 We LOVE this set of dies! It is certainly easier than Origami (which we love, but it takes patience for more intricate designs). I've already made 3 boxes-love the striped die-if you use with a multi coloured paper, it's adorable. We experimented with solid colour base triangles topped with intricate cut outs , and vice versa, and the effects were varied and fun! Some of the boxes we topped with little flowers or balloons. Fun set and super easy! Beginners may find the folds a challenge.